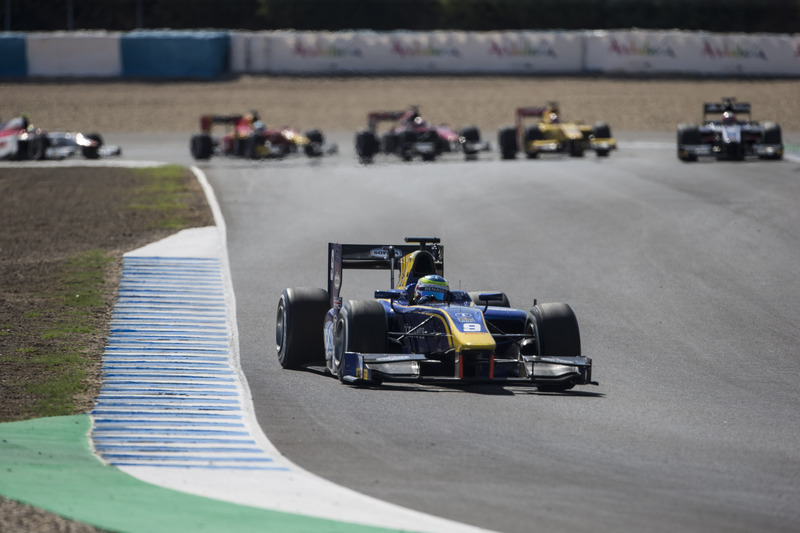 Running as the main event this weekend in Jerez, Formula 2 seemed determined to offer up drama and madness to the very last lap of the very last race. 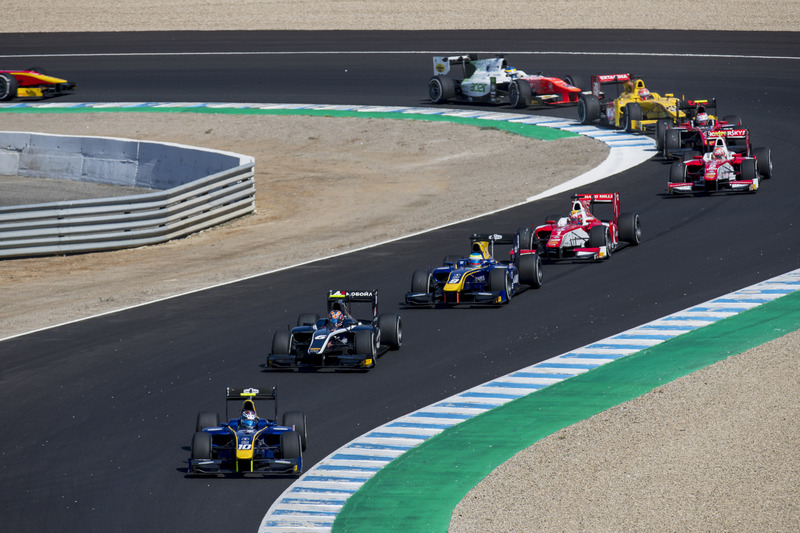 And if the on track action was not enough, Jerez provided us with the crowning of the series’ first champion, as Charles Leclerc secured the title on Saturday bagging himself back to back GP3 and Formula 2 championships in his bid to earn himself a seat on the 2018 Formula 1 grid. His qualifying performance on Friday saw him take his eighth pole position of the season, officially equalling Stoffel Vandoorne’s record for the most poles in a season of GP2/F2. Lining up beside him was Russian Time’s Luca Ghiotto, who was looking for a late season surge to seal the Vice-Champion title. And behind them was MP Motorsport’s Sergio Sette Camara, the youngest driver in the field who has hit his form since his win in Belgium. Likely to Leclerc’s relief, his nearest rival Oliver Rowland only managed fourth in qualifying. Knowing that he needed to outscore Leclerc to stay in contention, Rowland had made his job a little harder than it needed to be. The start of Saturday’s feature race went exactly to plan for Leclerc, who pulled away and began building a gap between himself and the rest of the field almost immediately. With perhaps a hint of desperation, but all the guts and determination worthy of a championship contender, Rowland overtook Sette Camara in the opening laps in an aggressive move that was entirely necessary to keep his title hopes alive. He set about trying to find away past Ghiotto, but while he battled away with the Italian, Leclerc was storming away in front. Eventually he found a way past on lap eleven, with a stunning move coming into turn one, but by this point, Leclerc was several seconds up the road. The first round of pit stops began on lap seven, but the leader did not pit until lap twelve, followed closely by Rowland. While Leclerc was able to inherit the net lead of the race, with only the drivers running the alternate strategy ahead of him, Rowland found himself stuck behind Camara and Albon, both of whom had successfully undercut him. It was around this time, when everyone was completing their first pit stops, that it became apparent that the DRS system was not working correctly after it became disabled for seemingly no reason. Whilst not detrimental to the race, it would turn out to be the first in a sizeable list of malfunctions that would occur over the weekend. After cutting his way through the field, Leclerc retook the lead of the race on lap twenty-one, with Rowland trying to follow, but struggling due to the greater number of drivers he had to overtake. And despite the Brit setting several blistering lap times in his pursuit of the Ferrari junior driver, he couldn’t quite find the pace to close up the gap fully. The race almost looked like it would run its course to an untroubled end, with Leclerc taking the title comfortably. That was until there was contact between Santino Ferrucci and Nobuharu Matsushita on lap thirty-two which, after a lap’s delay in which not even a single yellow flag was waved (despite debris on track and Ferrucci’s car beached in the gravel at turn one), the safety car was deployed. As the field bunched together and Leclerc lost the advantage he had worked so hard to gain, it became apparent that some of the late stoppers might be able to use their fresher tyres to make a last minute dash for the podium positions, and possibly even the win. But the real headache for the front runners was the fact that the lapped cars of Sean Gelael and Louis Deletraz either would not or could not, unlap themselves and found themselves caught in the middle of the battle between Leclerc and Rowland with the championship at stake. To make matters worse when racing resumed neither car was shown blue flags and began to battle with the frontrunners, making it so much harder for Rowland to catch Leclerc, who had bolted at the restart. Rowland even came under pressure from Leclerc’s teammate Antonio Fuoco who had made a stunning recovery drive from fifteenth on the grid and benefitted massively from the late safety car to eventually finish third. In the end Charles Leclerc was only 0.2 seconds ahead of Rowland when he crossed the line. But it was enough to take the title with three races to spare, an achievement he duly dedicated to his late father after clinching victory in a tribute helmet modelled after one of his father’s own. Formula 2 debutante Alex Palou, racing for Campos in place of Robert Visoiu, took reverse grid pole for Sunday’s sprint race after completing the impressive feat of scoring points on debut. 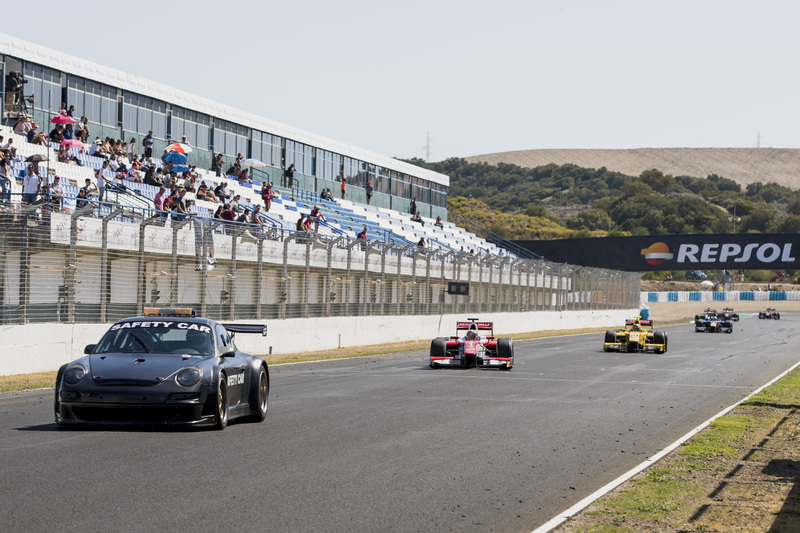 After a delayed start due to a broken down safety car, the race got underway about fifteen minutes later than planned, with Palou making a perfect start and managing to pull away as the rest of the field formed a train behind him. The feature race on Saturday had proved that while some teams suited the medium tyres (the compound all drivers start on in sprint races), others, including Prema, found it incredibly difficult to maintain any consistent speed with them, and struggled badly for grip. That led to a series of pit stops, which are ordinarily only taken if unavoidable due to the low number of laps in a sprint race. 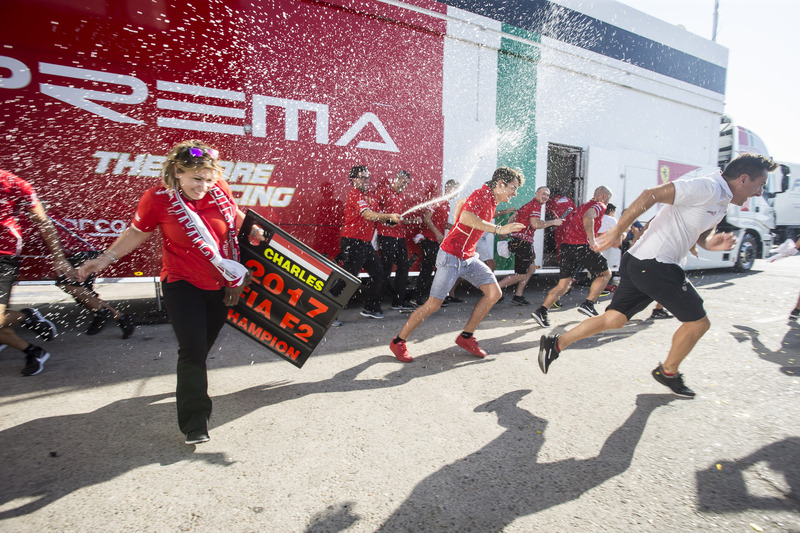 Amongst the stoppers were the Prema teammates, who, after making their way up to fourth and fifth, found themselves slipping down the order, and crucially behind the DAMS and Russian Times drivers, who they are now fighting with for the team’s championship. 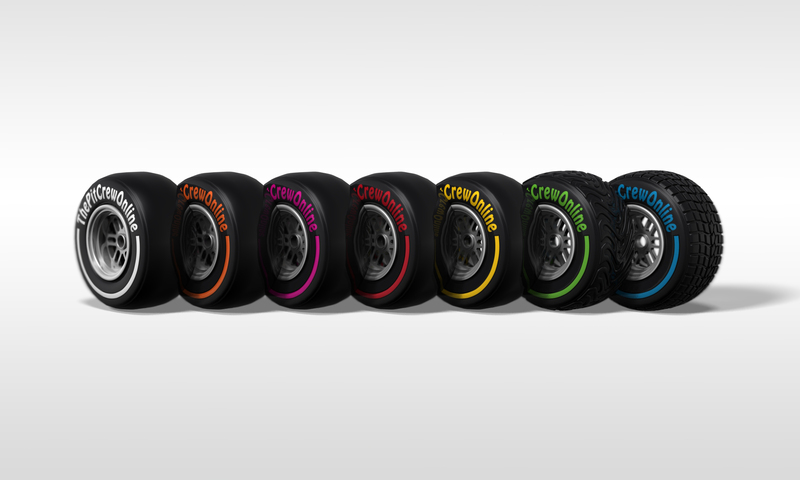 And the switch to the soft tyre proved to be the right one. Both Leclerc and Fuoco were posting lap times that were around three seconds quicker than the cars in front of them. While the Prema pair tried to work their way back through the field Nicholas Latifi and Markelov had closed the gap to Palou who was also beginning to struggle with his tyres. The ensuing battle between the three of them allowed Rowland, who was running in fourth place, to join the fray. Though Palou coped well under the enormous pressure being applied by the more experienced drivers he was finally passed by Markelov, who had used his uncanny ability to manage his tyres to kick his pace up a gear with just a handful of laps to go. Palou would eventually fall from the podium places with the DAMS drivers Latifi and Rowland able to score a double podium for their team, and the Spaniard would ultimately finish in eighth place. 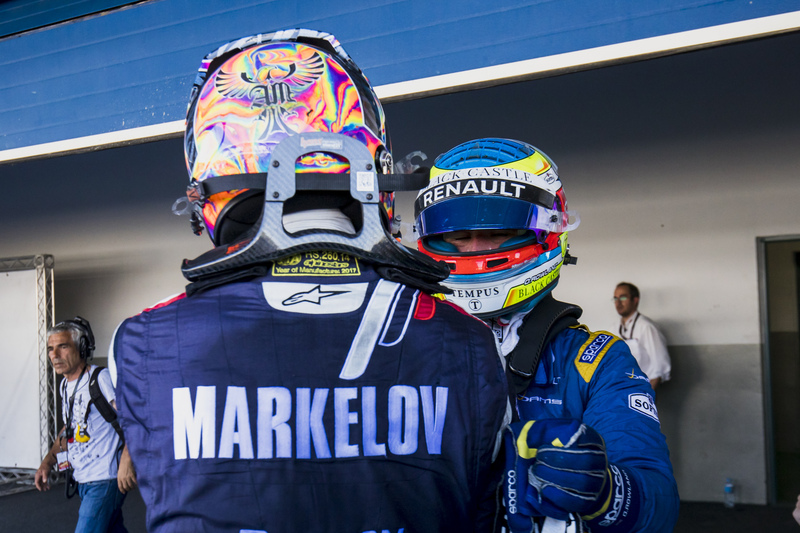 Markelov would be able to pull away and win by a stunning margin of eleven seconds earned through pitch perfect strategy and timing. Though both Fuoco and Leclerc did make it back into the points, the overtaking and fighting took it out of their softer tyres, and the best the new champion could do was seventh place, which his teammate leading him home in fifth, with Nyck de Vries sandwiched between them. Despite being run off the track on the first lap and having the fight his way from plumb last, Luca Ghiotto made a single stop strategy work for him as well to make an excellent recovery to finish in fourth place. It will come as a surprise to few to see Charles Leclerc wrap up the championship so emphatically with a round to spare, but that does not mean there is nothing left to play for when Formula 2 returns in Abu Dhabi for its final two races of 2017. 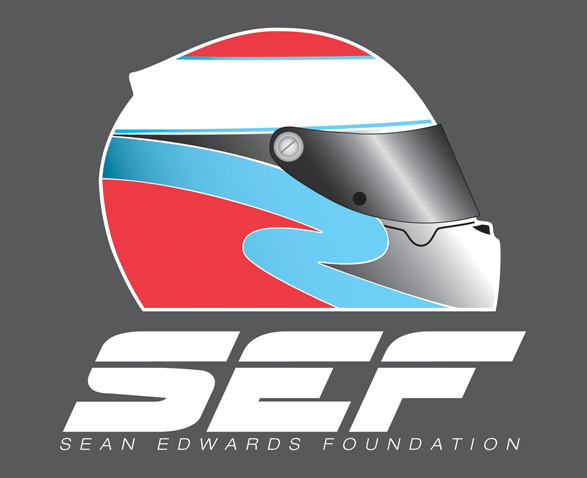 The question of who will take home the title of vice-champion still remains unanswered, and while it may seem like something of a consolation, second and third place in the championship each come with forty super license points – the number required to be eligible for a FIA super license and to be able to compete in Formula 1. The battle to win the F2 team’s title is also incredibly close, with Prema, DAMS and Russian Time all within six points of each other. It’s anyone’s guess as to who will take home that prize when the chequered flag falls on the sprint race in Abu Dhabi.